Why would an otherwise sane person do NaNoWriMo? Every year, hundreds of thousands of would-be novelists register for NaNoWriMo. They challenge themselves publicly – albeit sometimes under pen names – to write fifty thousand words in thirty frantic days. They do not do this for fun. Glaring at a laptop when you would rather be sleeping or relaxing with friends is not fun. Nor do the Wrimos – as participants are affectionately called – write for money. Only a fraction of NaNoWriMo books are finished, let alone published. For every success story like Wool or The Night Circus, there are a thousand half-written manuscripts going stale in long-forgotten file directories. 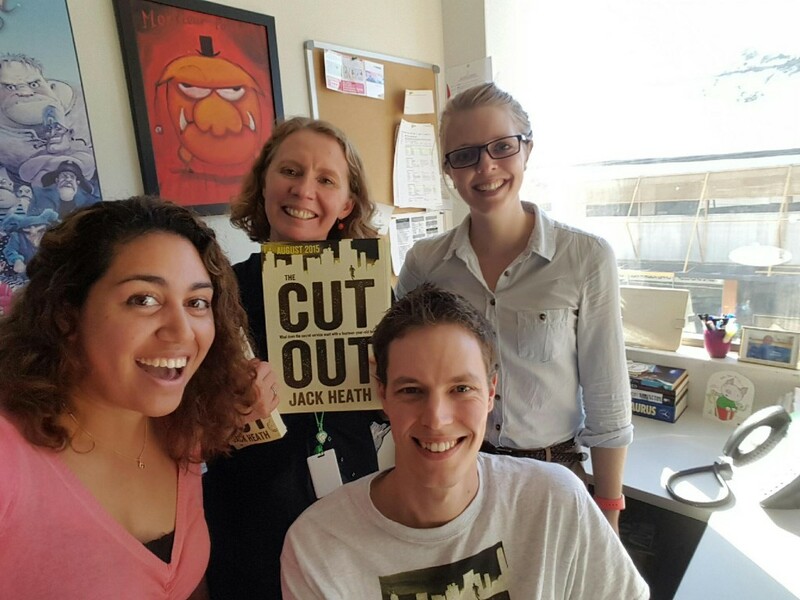 Jack with some of his A&U team ahead of the publication of The Cut Out earlier this year! So why do it? What possible reason could there be for an otherwise sane person to spend their evenings and early mornings and weekends clattering at a keyboard, fighting to reach 1,667 words every day? 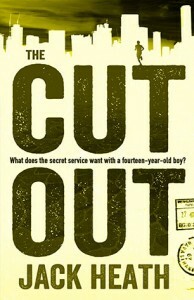 For NaNoWriMo 2012 I wrote The Cut Out, my new action thriller about a boy who is mistaken for a spy. I wasn’t a full-time writer then, so much of the book was bashed out at the café across the road from the call centre I worked at. If I didn’t reach my target word count before my shift, I’d write more on the long bus ride home. By November 30th I was exhausted and going prematurely grey at the temples, but the book was finished. So, on behalf of all Wrimos, let me try to answer the question: why? We do it because deadlines demand creative thinking. A book written in thirty days often has more interesting ideas than one written in thirty months. No pressure, no diamonds, as Thomas Carlyle once said. We do it because it’s impossible to create hundreds of characters and dozens of locations in a month, so most Wrimos don’t even try. Instead they strip away all the non-essential components and just tell an interesting story in an interesting way, which, in my opinion, is the best definition of a masterpiece. An ordinary teenager’s world turns upside down when he’s mistaken for a ruthless young spy. Hastily trained, loaded up with gadgets and smuggled across the border, he discovers the truth about espionage. Getting in is easy. Getting out alive is hard. We do it because it’s hard to keep a whole book’s worth of plot twists in your head at once – but it’s feasible, if you’re writing the epilogue only twenty-nine days after you wrote prologue. The Cut Out is full of lies, shifting allegiances, double-crosses, triple-crosses and false identities. If I had tried to write it over the course of a year, I wouldn’t have been able to keep track of what was going on – but thirty days was perfect. 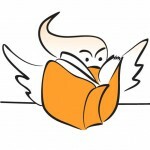 We do it because a reader who creates a novel – even a bad one, even a half-finished one – will walk away with a deeper understanding of literature. He or she will enjoy future books even more, just as an amateur musician can appreciate a good CD on more levels than the rest of us. We do it because if you only play life on easy mode, you never improve. Before NaNoWriMo, I couldn’t write a book in a month. Now I can. We do it because storytelling isn’t rocket science. It shouldn’t belong to the elites. Anyone can do it, so everyone should try, at least once. Jack Heath exploded on the Australian publishing scene as a teenager with his debut novel The Lab which was published to high acclaim. 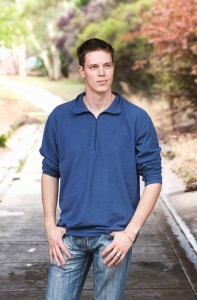 Since then Jack’s been published in the US and UK, and shortlisted for numerous awards including the Aurealis Award for Best Sci Fi Novel, and in 2009 was the ACT Young Australian of the Year. His NaNoWriMo written book The Cut Out was published earlier this year. As Jack says, NaNoWriMo is great because anyone can do it, as a platform for creativity and it’s a opportunity for improving your skills both in writing and reading. Check out Lili Wilkinson’s blog post for more NoNoWriMo tips. If a month seems like too much commitment, our Faber Writing Academy courses in Sydney and Melbourne could help – especially the one day Start to Write courses in Sydney or Melbourne. And if you need a target for that work, and are under 35, why not set yourself the goal of submitting it for The Australian/Vogel’s Literary Award? Entries open early next year, and close at the end of May. That gives you another six months to revise your NaNoWriMo work into something you’re proud of and want to publish. Alternatively, we accept submissions to our Friday Pitch every week, so if you’ve ever dreamed of being published why not use NaNoWriMo as the impetus to make it happen?